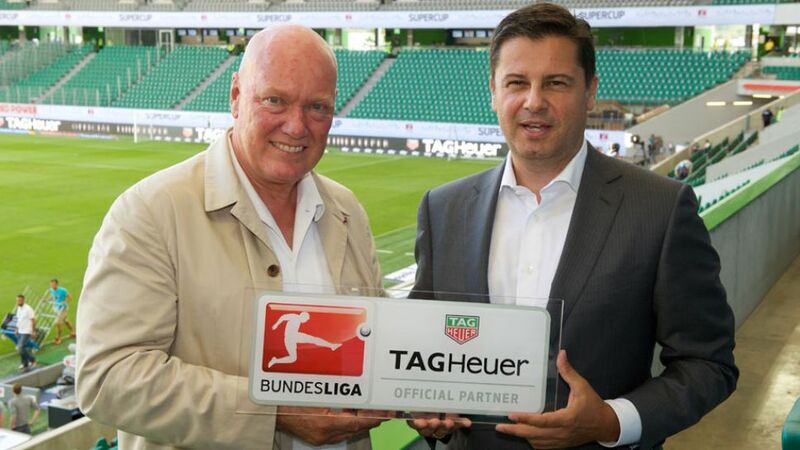 TAG Heuer "Official Bundesliga partner"
Frankfurt - Watchmaker TAG Heuer has been named "Official Bundesliga Partner" with immediate effect and will be sponsoring TV graphics with its logo superimposed during coverage of German professional football matches. TAG Heuer is a member of the Paris-based LVMH luxury goods group and has been active for many years as a sponsor of top international sports events and athletes as well as outstanding personalities. "We are thrilled to have found in TAG Heuer a partner whose quality standards and international outlook are a very good fit for Bundesliga - especially as sponsored graphics have a high global visibility. We are convinced that looking forward over the next few years both parties stand to benefit from this partnership," says Christian Seifert, DFL CEO, who announced the partnership together with Jean-Claude Biver, CEO of TAG Heuer and president of LVMH’s watch division. "Bundesliga is one of the most influential and comprehensive communications platforms," says Jean-Claude Biver, speaking on this partnership. "In this way, we will be able to harness entirely new sponsoring possibilities. It marks a perfect entry into the future of the TAG Heuer brand in the digital area in particular."